In our work, the reinforcement of the most promising biodegradable polymer, the poly(lactic acid) (PLA) with mineral basalt fibers was investigated to analyze the usability of the prepared composite material for durable, engineering applications. According to our previous results, optimized drying conditions were used to analyze its effect on the properties of basalt fiber reinforced PLA composites. 5, 10, 15, 20, 30 and 40wt% basalt fiber content PLA composites were prepared by using extrusion and injection molding. 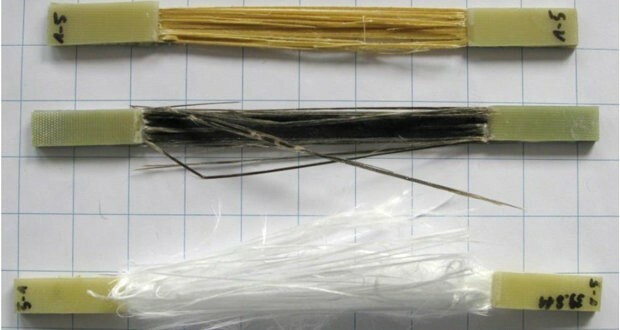 It was found that basalt fibers highly increased all of the measured mechanical properties (tensile, flexural, impact) and this increase was linear with increasing basalt fiber content in the case of tensile strength, tensile modulus and flexural strength, flexural modulus. By using 30wt% basalt fibers, a tensile strength and tensile modulus of 119.7 MPa and 7.62 GPa and a flexural strength and flexural modulus of 180.0 MPa and 10.37 GPa was reached respectively and moreover, one of the main drawbacks of PLA, the low impact strength was also enormously increased from 23.0 to 38.4 kJ/m2 and from 2.7 to 9.5 kJ/m2 according to unnotched and notched impact strength respectively. 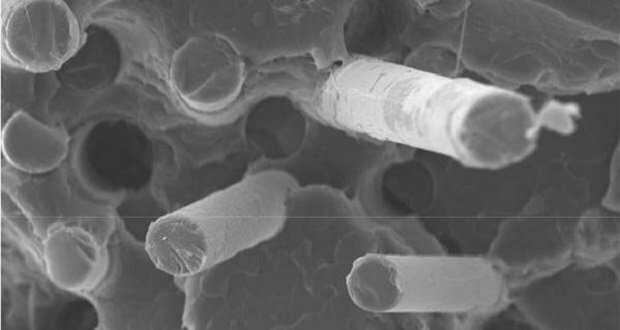 The scanning electron microscope observations revealed that there was very strong adhesion between the two phases which was indicated by the well embedded and well wetted basalt fibers. The basalt fibers were not only found to have significant reinforcing effect on PLA, but they also had nucleating effect. 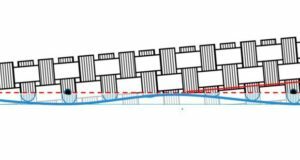 At the same time, the desired semi-crystalline PLA, which represents high HDT value of 120°C could only be achieved by using low cooling rate of 5°C/min. When using high cooling rate technologies like injection molding, more or less the half of the possible maximum crystallinity of PLA was found to be developed. 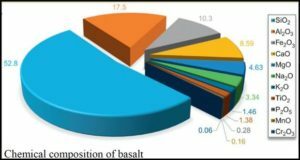 The basalt fibers not only had nucleating effect but they also increased storage modulus. 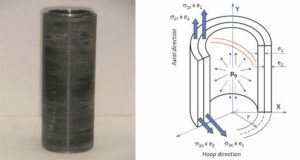 By using 40wt% basalt fibers, the storage modulus increased by 194% and by 940% according to the storage modulus measured at 40°C and 120°C respectively. It was also demonstrated that the basalt fibers could highly retard the deflection and deformation of the specimens above Tg, when PLA enters into rubbery state. At the same time, despite the significantly decreasing deflection with increasing basalt fiber content, the standardized HDT value of the specimens only increased by 5°C by using 40wt% basalt fibers, which can be explained by the very small permitted deflection (0.33 mm) according to a standard HDT test. Nevertheless, the major increase in storage modulus and the nucleating effect of basalt fibers indicate that by using further nucleating agents, like the highly effective talc, PLA based composites with high HDT value can be produced. Finally, in our work it was proved that it is possible to produce renewable (PLA) and natural (basalt) resource based composites with high mechanical properties not only by using very high cycle time processing technologies like film stacking or solvent casting to avoid fiber breakage but it is possible to use highly productive, low cycle time injection molding technology to produce accurate parts with complex geometries for high demand engineering applications. T. Czigány, MTA–BME Research Group for Composite Science and Technology, Department of Polymer Engineering, Faculty of Mechanical Engineering, Budapest University of Technology and Economics, Budapest, Hungary. J. G. Kovács,Department of Polymer Engineering, Faculty of Mechanical Engineering, Budapest University of Technology and Economics, Budapest, Hungary. T. Tábi, MTA–BME Research Group for Composite Science and Technology, Department of Polymer Engineering, Faculty of Mechanical Engineering, Budapest University of Technology and Economics, Budapest, Hungary.